Vitality is proving to be a big part of our lives at the moment…. We have a VitalityLife Insurance Plan which has some great perks and incentives to keep us on the move, including points for being active and we all know what points mean, PRIZES…. The prizes that we are particularly fond of is the 4 free cinema tickets per week if we collect a certain amount of points as well as the free Starbucks drink a week. Having perks like these really has given us some motivation to get out of the door and MOVE. All of our movements we track on our Garmin devices and is automatically up-loaded into our Vitality account. It has been known to get a little “silly” when my husband has quite done his 12,000 steps for the day to achieve his 10 points so will pace around the house before he goes to bed! When I received an email inviting me to take part in the VitalityMove event on Sunday 17 September in Windsor Great Park, I was genuinely excited as I love the brand and the main brains behind this unique event – Jessica Ennis-Hill. Windsor Great Park has some fond memories for me – I have ran the Windsor Half Marathon several times and just think The Long Walk is such an iconic run, and it is LONG!!! Well, training whilst being Mummy to three kids under three and running our own business requires being creative with my time…. Early-morning runs before the kids get up, organising babysitters to be with the kids in the evening once they are in bed so we can both go out for a run with our local club and using the creche at the local Leisure Centre are some of the ways I fit in training! 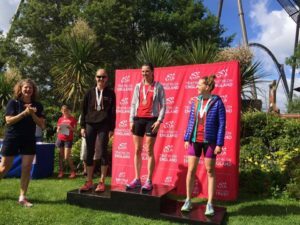 I have taken part in two organised events recently – the Binfield 10km and the Triathlon England National Sprint Distance Championships at Thorpe Park – both of which I came away with a silver medal. Binfield 10km I was second lady overall and Thorpe Park, 11th lady overall and 2nd in my age group….